When first called up to the NHL the Chicago Blackhawks prospect Andrew Shaw turned heads as he scored five goals in his first eight games including a goal in his first career game. 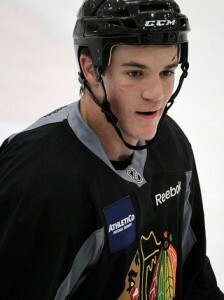 Shaw a 5th round pick of the Blackhawks in 2011 and has had a meteoric rise from junior tough guy to solid offensive contributor at the professional level. However as the games wore on Shaw struggled to find the back of the net, looking outmatched on the ice and saw his ice time greatly diminished. Then on February 17th Shaw was reassigned to the Rockford Ice Hogs and it seemed as though Shaw was unlikely to get a second chance with the ‘Hawks this season. Then just 15 days later on trade deadline day the ‘Hawks dealt tough guy and fan favorite John Scott to the Rangers for a 5th round pick. After the deal Shaw would get his second chance with the Blackhawks and has has made the most of it, scoring 6 points in a nine game stretch. Shaw has had found some great chemistry on the ‘Hawks shutdown line with center Dave Bolland and left wing Bryan Bickell. This line of Shaw, Bickell and Bolland has played outstanding hockey during the ‘Hawks last 9 game stretch playing against the other teams top lines and also chipping in on the scoresheet. For someone who was not expected to have any impact in the ‘Hawks locker room this season much less in the minors has exploded onto the Chicago scene and is quickly becoming a fan favorite and has spawned a twitter sensation with #ShawFacts. Shaw has quickly found himself as a key contributor to what would seem to be a cup contending team and if he can continue his hard nosed play along with some finish there is no telling what he could potentially become. Whether he is the next Adam Burish or the next Kris Versteeg if he can contribute in one of those roles for this ‘Hawks team they might have finally found a suitable piece that they have desperately missed since their 2010 Stanley Cup victory.